Early in the Second World War, on 11 September 1940, a unit of the Manitoba Volunteer Reserve was formed in Flin Flon, Manitoba. The volunteer reserve was organized along the lines of the British Home Guard for local defence purposes. Most of the Flin Flon members worked for Hudson Bay Mining and Smelting or the town of Flin Flon. Some were shopkeepers or workers at other local businesses in the prosperous young mining town. The size of the unit varied from 60-80 personnel. Many members later served in the active service force as the war progressed. The Commanding Officer was Captain Fred Willis MC. He was a new Zealand Veteran of the First World War, who was employed by HBM&S. Training in foot and rifle drill, first aid, and communications was held two nights a week in the old Community Hall. Members purchased their own uniforms, and at first drilled with locally made wooden rifles. From this small formation, the first active Reserve Army Unit was formed. 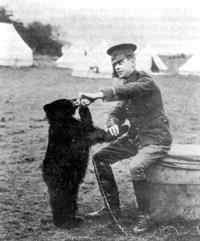 The role of the Reserve Army during the war was to provide pre-enlistment training for younger men, and act as a Home Guard, ready to be called up for the defence of Canada if required. Men in restircted occupations, deemed critical to the war effort, were not allowed to join the active service force, but could serve in the Reserve Army. It was thought the Volunteer units should be given more official status and a Regimental affiliation, so, on 1 March 1942, the Flin Flon and Dauphin Manitoba Volunteer Reserve was re-organized and renamed the 10th Canadian Armoured Regiment (Fort Garry Horse) Reserve. Squadrons were located in Flin Flon and Dauphin, with an outlying group in Sherridon. The active Fort Garry Horse, of Winnipeg, had been fully mobilized in 1939 and was then training in England for their eventual role in the invasion of German occupied Europe. Eventually, standard army battledress was issued, along with the black beret of armoured troops and the Garry cap badge. The unit received radios, a 15 cwt truck and two Ford Lynx scout cars for training. Lee-Enfield rifles and Bren guns were also used. Training continued on selected evenings with occasional special tasks on weekends. In the summers, training camps of 10 days duration were held at Camp Shilo, near Brandon, Manitoba. The unit travelled south by train, picking up the Dauphin men along the way. The training in Shilo was intensive, to take full advantage of the limited time available. In the winter of 1943, A and B Squadrons in Flin Flon participated in operational manoeuvres in -40 temperatures. The Reserve Army Garrys were disbanded at the end of the war in 1945, but in 1946 the 52nd Heavy Anti-Aircraft Battery, Royal Canadian Artillery, was established in Flin Flon with 157 and 161 Batteries in The Pas and Dauphin. Many of the men continued to serve in this new role. In 1949 the Anti-Aircraft units were concentrated in Winnipeg and in March of that year 21 Field Squadron Royal Canadian Engineers was formed in Flin Flon. 21 Field Squadron was deactivated in 1995.